Mayfield Robotics , a Bosch startup out of Redwood City, CA, at CES proudly unveiled Kuri, an intelligent robot for the home. Kuri is designed with personality, awareness, and mobility, and adds a spark of life to any home. Priced at $699, Kuri is available for pre-order in the U.S. with a $100 deposit starting today at heykuri.com. Kuri is built to connect with you and helps bring technology to life. Kuri can understand context and surroundings,recognize specific people, and respond to questions with facial expressions, head movements, and his unique lovable sounds. Like many adored robots in popular culture, his personality and ability to connect are his greatest attributes. Hours of battery life, and when it’s time to refuel, he simply returns himself to his charging dock for a quick charging nap. Kuri is 20” tall, weighs about 14 lbs, and includes an app for iOS and Android for setup and controlcapabilities. Mayfield Robotics plans to ship the first Kuri robots for Holiday 2017. 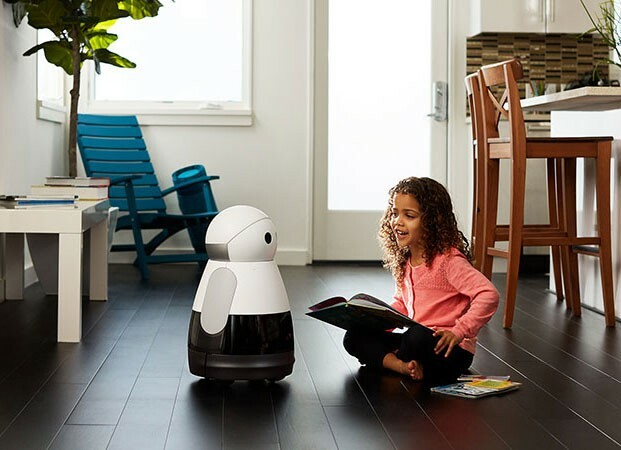 Mayfield Robotics is the maker of Kuri, a new kind of intelligent home robot. Born out of the Bosch Startup Platform, the company is a wholly owned subsidiary of Robert Bosch North America Corporation. Founded in 2015 by Sarah Osentoski, Kaijen Hsiao and Mike Beebe, the company is based out of Redwood City, California. For more information, visit www.mayfieldrobotics.com, and to pre-order Kuri, visit www.heykuri.com. Dieser Eintrag wurde veröffentlicht in Development, English, General und verschlagwortet mit CES, Kuri, Mayfield Robotics von Sebastian Trella. Permanenter Link zum Eintrag.